The ones which admire the original will love the model. An extraordinary collectible in exclusive quality with an unique charisma. Handmounted precision model made of 1,387 single parts. Composed by diecast, metal and copper. 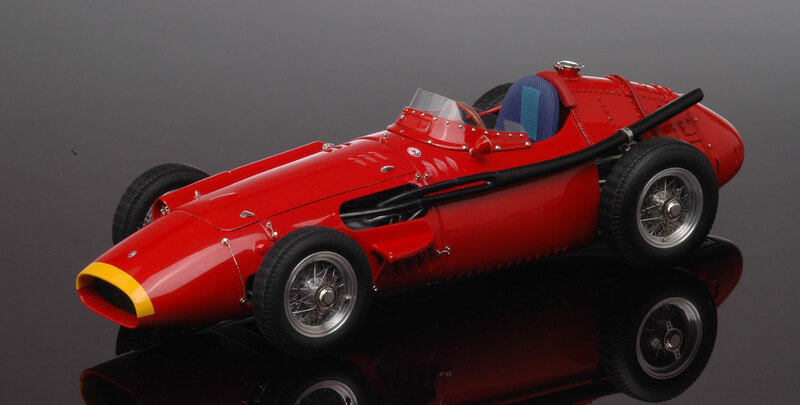 The 250F is called one of the most beautiful classic monoposto cars who ever hit the racetrack. 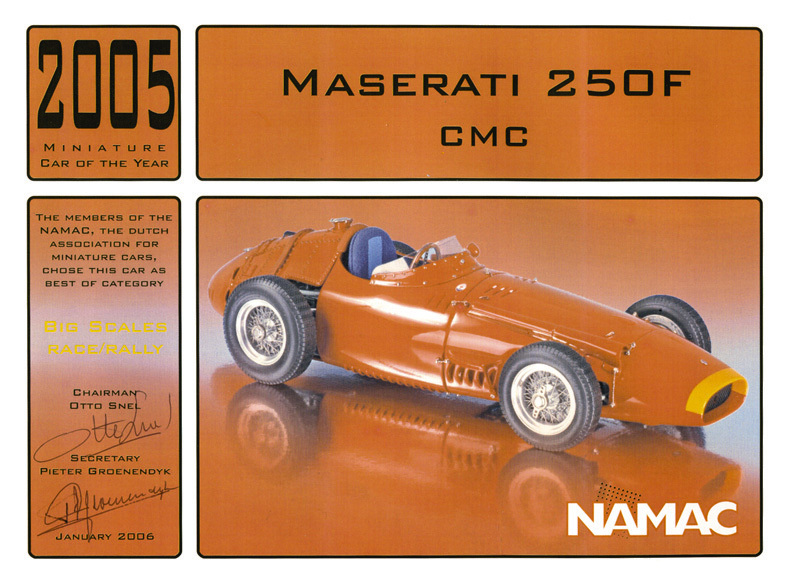 90-years-old Maserati was reason enough for CMC to focus on this make, which is undoubtedly one of the most venerable Italian manufacturers of racing cars. CMC celebrated its 90th birthday with a replica of the 250 F. After all, this racing car is deemed the most beautiful Monoposto that had ever hit the racetrack. In addition, 1957 was a very remarkable and eventful year in the company history. Back then on August 4, more than 200,000 spectators witnessed the start of the Grand Prix of the century at the Nürburgring. After an acrimonious fight with his chief rivals Mike Hawthorn and Peter Collins, each of whom drove a Ferrari 801 F1, Juan Manuel Fangio was able to celebrate one of his mot thrilling wins in his more light-weight Maserati 250 F with a lead of barely 3.6 seconds. Thanks to this terrific victory that led to his fifth world championship, Fangio became a legend in racing history, and so did the 250 F.
This precision model is hand-assembled from 1,387 single parts. As can be seen here, our attention was focused not only on the body, but also the “inner life” of the car; it translated into the highest possible level of detailing. Some of the parts are, of course, invisible after the assembling, as in the case of the original car.